This blog is a new project, intended as a space where unformed ideas might find their first articulation. Over the 2014 Fall semester I am going to attempt to record a daily thought: just something small that is interesting or troubling me. I welcome your feedback, and hopefully some of these posts can spark further thoughts, debate or critical exchange. As it is Friday, I thought I would post something a little bit lighter. In one of my earlier posts this week, I mentioned that museums are a guilty pleasure of mine. One side effect, is that my son Gabriel has found himself pushed around quite a few institutions. 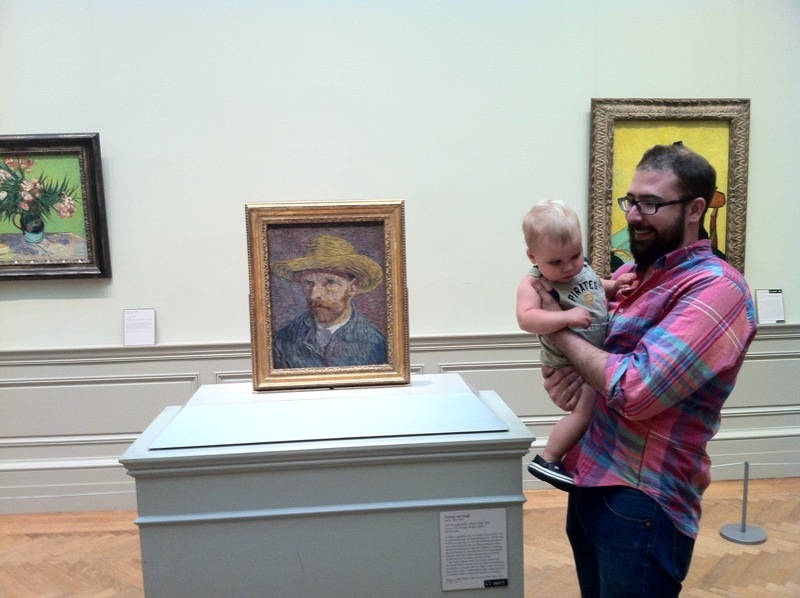 In his short 14 months on the planet, he has been to the Carnegie Museum of Art, the Hood Museum at Dartmouth, Toledo Museum of Art, the Art Institute of Chicago, the Met, MoMA, the Guggenheim, and the Brooklyn Museum (just to name a few). It has been really gratifying to see Gabe become so comfortable with the museum environment, pointing excitedly to things he recognizes, clapping and smiling to video installations, or peering curiously at things he finds of interest. Clearly I am not the only parent who likes the idea of taking their children to museums (indeed, as the modern museum was founded on the idea of public enlightenment and self-improvement, it seems an inevitable result). I am not sure whether art museums can help stimulate cognitive development or produce more enlightened young citizens, but I do know that in my life the arts have always given me great pleasure. More than anything I would like to share that with my son; to inculcate the value of imaginative and poetic pursuits, so that he too can glimpse the myriad ways of seeing the world around us. Most major museums now cater to children in some way or another. MoMA and the Chicago Art Institute both have terrific children’s areas. The Andy Warhol Museum in Pittsburgh has fantastic programs for slightly older kids, and thanks to Daniel Baumann, the Carnegie Museum now has a wonderfully retro Lozziwurm. 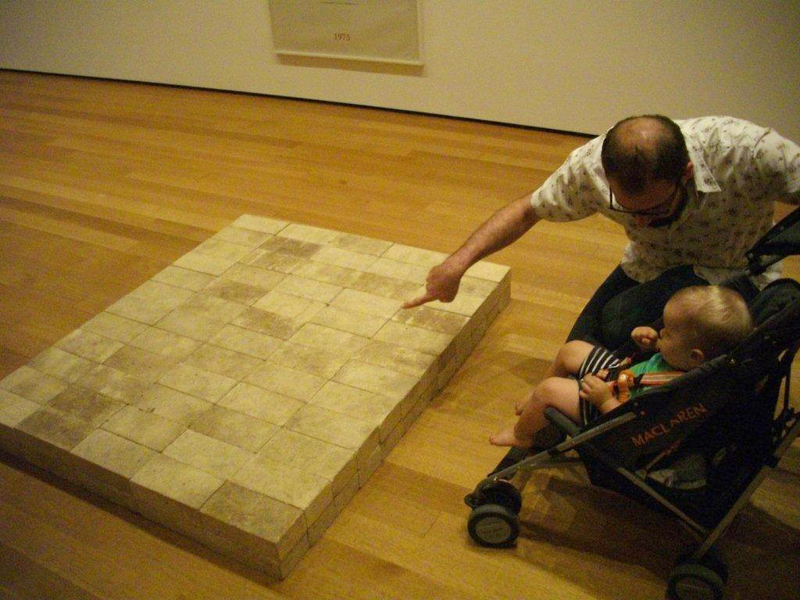 The Toledo Museum of Art not only has a family center, but also offers “baby tours.” Many museums offer “stroller tours” – but more often than not, these are pitched equally at the parents as the toddlers (a bit like the moms and bubs sessions offered at cinemas). Toledo’s program differs, in that it was designed by Dr. Kathy Danko-McGhee, an expert in early child development. 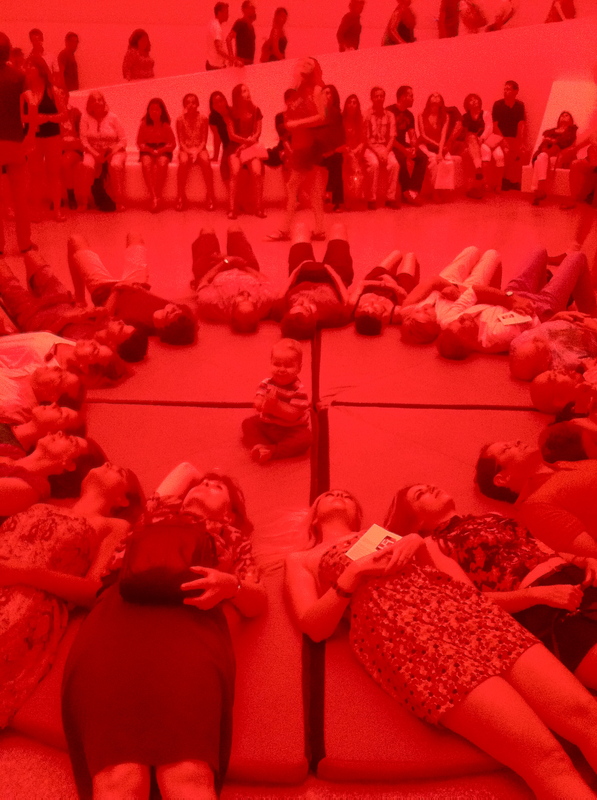 Designed for children from 2-18 months, these tours have a duel purpose: to stimulate cognitive development in young children, and to teach parents and caregivers how to engage babies’ with art, which in turn promotes brain growth and literacy skills. Sensibly, the tours are limited to half-an-hour, to accommodate for babies’ short attention span. I am yet to take Gabriel on one of these tours, but am hoping we can get to one in the next few months. Crikey it’s big! 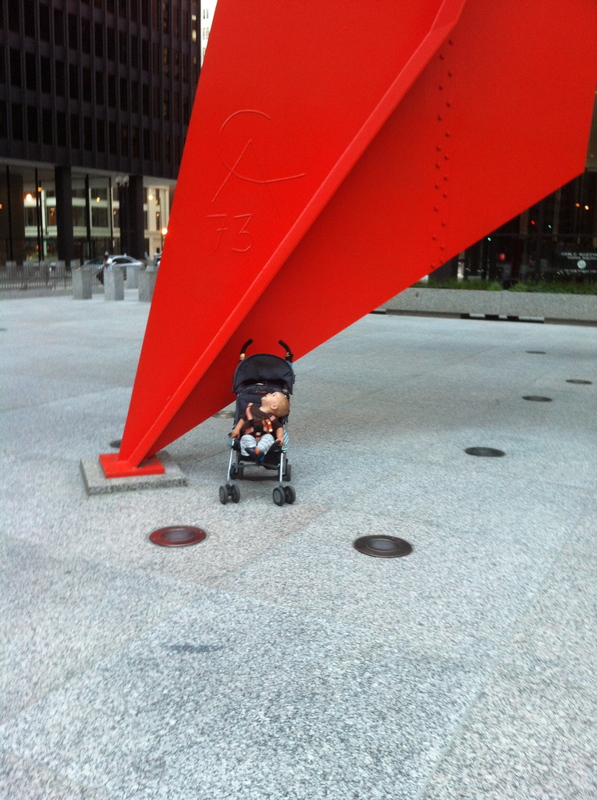 Checking out Alexander Calder’s Flamingo 1973, Federal Plaza, Chicago. As it is Friday, and the end of the first week of my daily blogging exercise, I wanted to throw open the floor to you. What are your thoughts about taking baby to the museum? 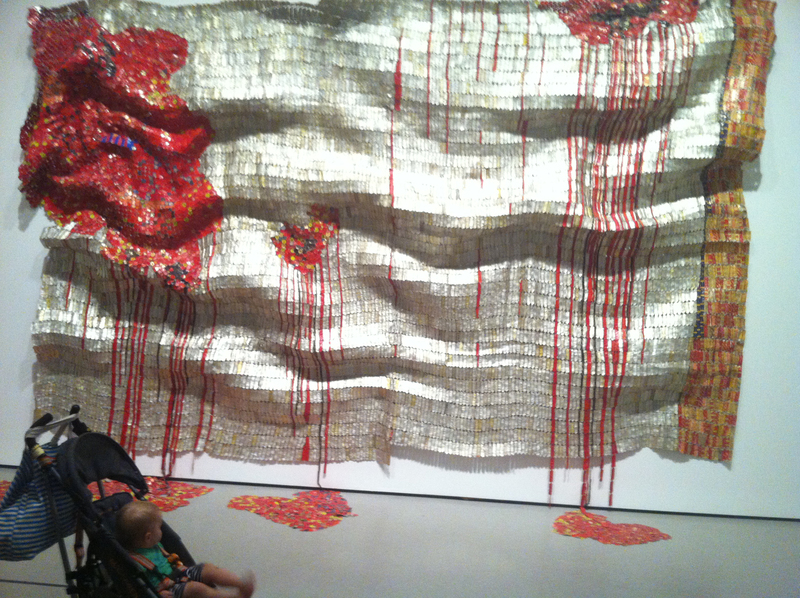 Do you think there is value in taking small children to museums? Have you had any great experiences, or shocking disasters? Is there a museum you particularly love, or a program that you think warrants commendation? Alternatively, do you think children should be left at home; that museums should be a quiet place for adult contemplation? I really look forward to hearing your thoughts, comments, stories… Till then, see you next week. I think I’m ready to go Dad! With Van Gogh’s Self-Portrait with Straw Hat, 1887, Metropolitan Museum of Art, New York.